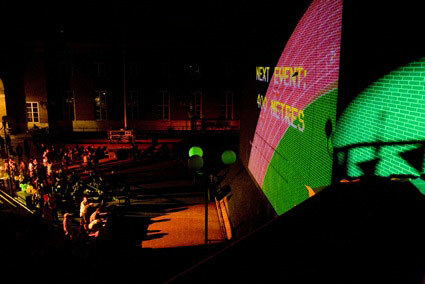 This is cool - last weekend OGRE was one of the technologies behind an interactive public event called Animation Decathlon, inspired by London 2012, which involved kids in London playing a kind of version of Track and Field via Arduino-controlled custom ‘thumping pads’ 😀The images were projected onto the side of Kensington and Chelsea town hall, and the BBC has a page about it. If you think the characters look like they were drawn by children, that’s because they were 😀The characters in the game were drawn by kids from the borough and animated by the creators, Quadratura. I love this because a) it’s in the UK, and open source adoption is much lower in the UK than in the US or Europe, and b) because I just love public events / art like this. In recent years it seems OGRE has become increasingly popular for this sort of work, resulting in OGRE-based applications appearing in public spaces all over the world, such as the Science Museum in London, the Calgary Stampede, the Australian Museum in Sydney, and the history museum in Nantes, among others. As well as being happy to see OGRE in unique set-ups like this which are always interesting, it’s also gratifying because by nature systems of this sort need to be robust - they’re sitting there all day being tinkered with by loads of (untrained) people, so they require a certain level of resilience and stability 😀Therefore I treat the fact that people are trusting OGRE to run them as a very positive thing. We’ll keep trying to be worthy of this trust!